After fighting unsuccessfully for years in court and at the ballot box to prevent construction of the Gordie Howe International Bridge, the owners of the Ambassador Bridge are turning to President Donald Trump for help. The Moroun family’s latest effort to halt the publicly owned Detroit-Windsor bridge project is being made via a TV commercial. Trucking magnate Manuel “Matty” Moroun has long wanted to build his own second span between the United States and Canada to replace his deteriorating, 87-year-old bridge. His replacement six-lane bridge would span 2,190 feet, with dedicated NEXUS, FAST and bus lanes. Screenshot from the Detroit International Bridge Co. TV ad. “There are two grand new bridges being proposed in Detroit between America and Canada. One is American-made, American-owned. It uses American-made steel,” the ad claims. 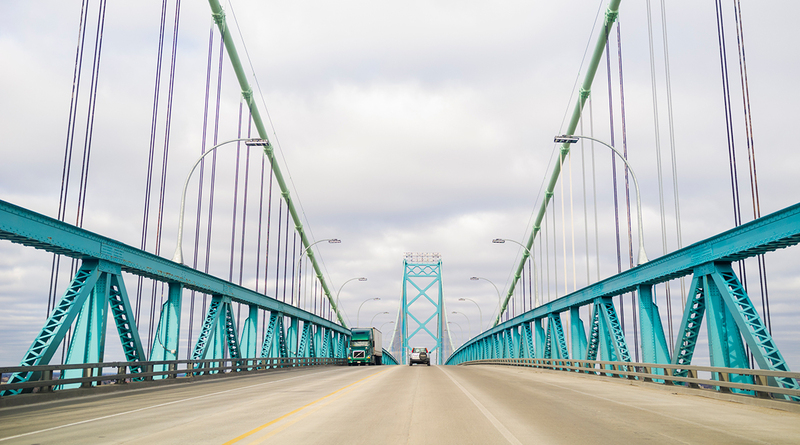 The Gordie Howe International Bridge would in fact be owned jointly by Canada and Michigan, and the ad is misleading in numerous ways, according to the Michigan Department of Transportation. “The ad also falsely suggests that steel used to build the Gordie Howe International Bridge will come from overseas. The facts: The “Buy American” waiver requires all steel to come from either the United States or Canada, which is more than appropriate given that the Gordie Howe International Bridge will be a vital border crossing connecting these two countries,” according to a statement from MDOT. Canada plans to cover the cost of the $2.1 billion, 1.5-mile-long six-lane bridge, plus a $250 million customs plaza on the U.S. side. Michigan’s share is to be repaid in the form of toll collections over several decades. The state is in the final stages of acquiring land needed on the U.S. side to begin construction on the bridge. Officials still are working to obtain title to 25 commercial properties in Detroit’s Delray area. Of those, 20 belong to the Morouns, according to MDOT. “MDOT is in the final acquisition stages of all but the Moroun parcels, which remain in litigation,” spokesman Jeff Cranson said. The ad was paid for by the Detroit International Bridge Co., the Moroun organization that maintains the Ambassador Bridge.